Nippers is all about learning, confidence and having fun in a safe beach environment. For Nippers, the beach is the classrooom. They gain confidence with swimming, body boarding, beach sprints, dolphin-diving, spotting a rip, having fun with new friends and discovering things about themselves. Nippers is a junior program that introduces children aged 5 to 13 to surf lifesaving. It's a fun outdoors activity that grows a child's confidence, teaches valuable life skills and knowledge. 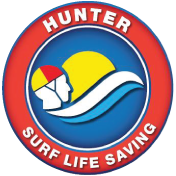 Every surf lifesaving club around Australia offers a Nippers program, all with various styles and sizes. The Nippers today are the future of surf lifesaving tomorrow. Nippers are Australian for life. Boys and girls aged Under 14 as at 1 October are eligible to join. Children must also be 5 years of age at the time of enrolment. If they are not 5 years old before the 1st of October they may join nippers on their 5th birthday up until December 31st. For new members a copy of your Birth Certificate or passport will be required for verification. The fee structure and clothing requirements is available on registration days which are advertised on Club Websites, to download this information please see our Hunter Branch Home Page with a link to all Clubs. Parents should remember that Junior Nipper Activities does not teach swimming. To participate in the water events and at any carnival, all Nippers must complete the Surf Education program, and a timed pool swim with an additional Ocean Swim for Carnival Attendance.